Named after a bar regular at my old stomping ground, Uno Chicago Grill, German Assassin is a pseudo-Schwarzbier (German Black Lager). I say ‘pseudo’ because our version is not really a lager. To simulate the lager experience we used a clean fermenting ale yeast, and fermented it at the coolest temperatures our humble castle will allow. We brewed German Assassin with all German ingredients, and it is even one of our few brews where we adhere to the Reinheitsgebot (German Purity Law). The recipe includes Munich, German dark crystal, and Carafa III malts, and German noble Tettnang and Spalt hops. Many of you will be intimidated by the German Assassin due to his dark color. But don’t worry, for he is a beer vigilante sent to assassinate your biggoted assumptions. 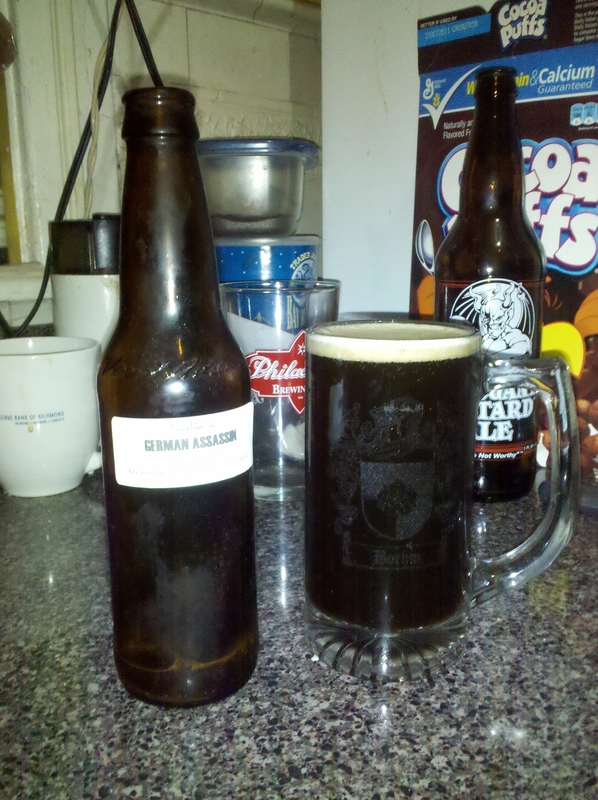 German Assassin does have mild chocolate and coffee notes, however the predominant taste is the light malty sweetness and is rounded out by a hint of noble hops. German Assassin is light bodied, and full of flavor without being overwhelming. Deceptively smooth, he may just seduce you into the world of real, flavorful beer. This entry was posted on January 11, 2011, 11:22 PM and is filed under Beers. You can follow any responses to this entry through RSS 2.0. You can leave a response, or trackback from your own site. German Assasin is a winner! Was German Assassin your favorite of the sampler you had?